Get The Best Deals on Ceiling Fans Ever! You are going to be greatly satisfied with yourself for finding such an incredible selection of ceiling fans. All at guaranteed lowest prices. Beat the heat with a new ceiling fan. Save up to an additional 40% Off Select Kichler Fans. With coupon code: KICHLERFANS15 at HansenWholesale.com. Valid through August 4th. Shop Now. Take 12% OFF For Craftmade! Craftmade Sale - Save an Extra 12% OFF For Craftmade. With coupon code: CRAFTMADE12 at HansenWholesale.com. Limited time offer. Shop Now. Get 10% OFF Emerson Ceiling Fans. With coupon code EMERSON10 at HansenWholesale.com. Valid through June 30th. Shop Now. Free Remote with Casablanca!! 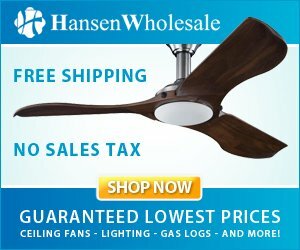 FREE remote ($80 value) with the purchase of select Casablanca ceiling fans at HansenWholesale.com. Limited time offer! Hansen Wholesale was the very first company to bring ceiling fans and fireplace decor to the Internet (in 1994) and we have literally been online longer than Google! We've been in business since 1976 supplying these products to retail customers and wholesale buyers all over the country. We literally live and breath ceiling fans. Our years of experience dealing with online customers at both the retail and wholesale level gives us a sharp competitive edge and has helped us grow into one of the single largest suppliers of ceiling fans, lighting, and fireplace decor on the Internet. We really are "The Worlds Greatest Ceiling Fans"